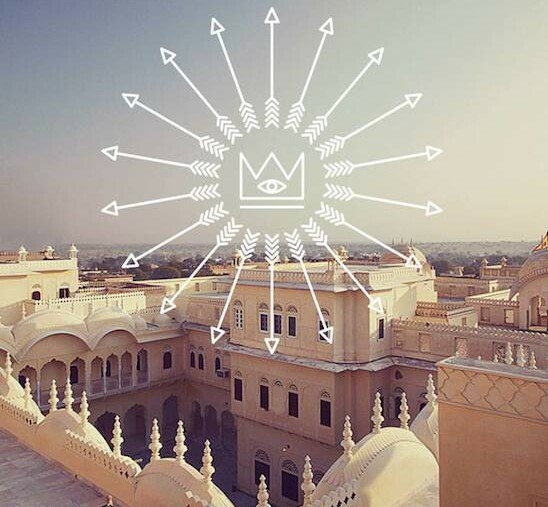 The striking backdrop of a 17th century palace combined with impeccable Rajasthani hospitality, the freshest underground sounds from India and abroad, and the perfect blend of heritage arts mixed with contemporary culture: Magnetic Fields – a brand new music and arts festival – promises an exciting new festival experience. 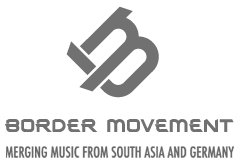 With the majestic Alsisar Mahal as the venue for the December 13-15th 2013, and exciting acts like Charanjit Singh, Robot Koch, Mother Perera, Shiva Soundsystem, Shaa’ir + Func,Midival Punditz slated to perform till 4 am every day, Magnetic Fields has the makings of a non-stop 3-day celebration of music. But great music isn’t all that Magnetic Fields has to offer. From local delicacies to vegan food options to one-off designer clothes on sale and never-seen-before stage designs and visuals and secret pop-up parties, there’s a lot to look forward to at Magnetic Fields. The two stages, North and South, are definitely one of the biggest aesthetic highlights of the festival weekend. 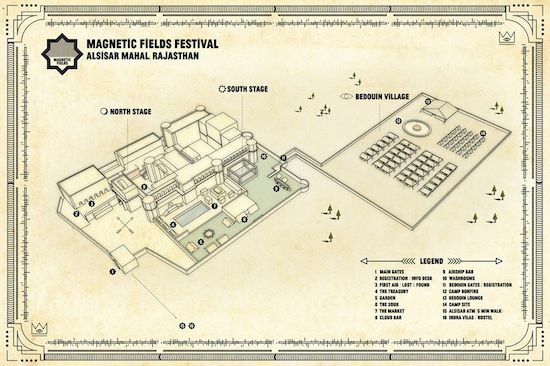 Magnetic Fields will be the first music festival designed by a label and design house. Acclaimed label 11.11 by CellDSGN will be creating the Magnetic Fields aesthetic, locally sourced materials and traditional Rajasthani design elements will be combined in unconventional ways to create a brand new experience. The South stage, which is the day stage features a gigantic, shimmering glass chandelier while the North stage, the night stage, is designed like a moving theatre, reminiscent of an old-style carnival. The visuals for the two festival stages will be taken care of by Amandeep Pablay aka Spiral Viral , the man behind Dualist Inquiry’s custom-made projection mapping rig for his Doppleganger LP tour, in collaboration with Brandon Epperson, CEO of Venom Designwho has worked on stage and sound production for artists like Grammy Award-winning artists like Kanye West, Madonna, Paul McCartney and broadway musicals. Designed to mimic a local mela, the food options at the festival will be a gastronomical bazaar of fresh, light and ready to eat delicious treats drawing inspiration from cuisines of the streets of India and around the world. There will be fresh fruit juices and smoothies for the health-conscious, falafel wraps in freshly-baked wraps, the very famous local delicacies like laal maas (red meat) with naan and the sumptuous Rajasthani thali, and gourmet pizzas, among a wide variety of culinary options. To keep the chill at bay, will be mugs of mulled wine and jugs of sangria. The Food bazaar will be styled and presented like at a local mela (fair) with hawkers selling different types of foods on portable carts and stalls. All the ingredients used will be locally sourced, fresh and un-processed for a wholesome and hearty experience. The souk-like bazaar will have something for everyone. Festival attendees at the festival can browse through stalls offering an eclectic mix of designer clothes, quirky and unique accessories, intriguing costumes and headgear that will help you look the part at the secret pop-up parties. Sticking to the magical theme will be the Magnetic Fields currency, available in special little bags, straight out of medieval times.